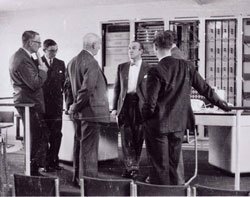 Photos of ERNIE, the British 1950s computer that generated random numbers for the premium bonds draw, which has just gone on on display at the Science Museum, London. One of Britain’s oldest commercial computers is to go on display at the Science Museum. ERNIE (Electric Random Number Indicator Equipment) 1, the machine which randomly generated winning premium bond numbers, will take its place in the History of Computing gallery. Millions of people checked to see if ERNIE had come up with their numbers. Draws were televised and celebrities and members of the public were keen to visit and pose with ERNIE. If ERNIE 1 was used for the prize draw today it would take 52 days to generate the numbers, while ERNIE 4 takes just three hours. Weighing 1.8 tonnes and the size of a van, ERNIE ran for sixteen years from 1957 until 1972 and was followed by ERNIE 2 in 1973, ERNIE 3 in 1988 and ERNIE 4 in 2004, with each machine smaller and faster than the last. ERNIE was built at the same place as Colossus, the Post Office Research Station at Dollis Hill, and by some of the same engineers. ERNIE used the random movement of electrons in a neon diode to achieve this through a physically random event and cost £25,000 to build.